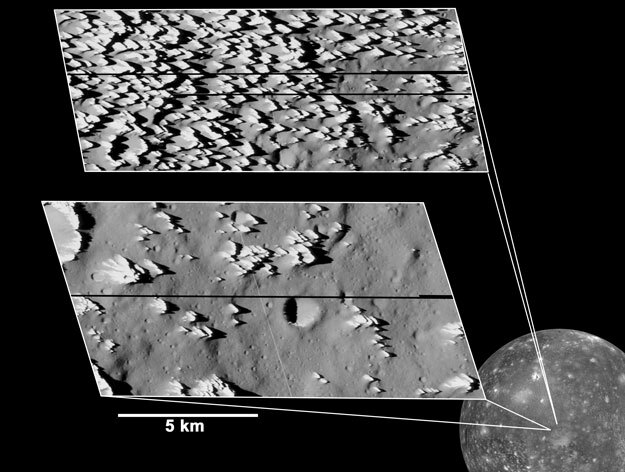 Explanation: Why does Jupiter's moon Callisto have unusual jagged hills? This mystery came to light after the robot spacecraft Galileo, in orbit around Jupiter since 1995, swooped past the dark moon in May. The resulting pictures were the highest resolution yet obtained for a Jovian moon: objects as small as 3 meters across are discernable. The strange landscapes pictured above show areas rich in bright sharp mounds about 100 meters tall. A likely formation hypothesis holds that these hills are the result of ejecta thrown billions of years ago during a violent impact. The lower inset region apparently has undergone an epoch of relatively high ice-erosion, where dark rock has filled in some of the inter-hill regions. NASA has recently cleared Galileo to continue swooping Jupiter's moons until 2003, when it will end its journey with a spectacular dive into Jupiter's atmosphere.